My husband is turning 30 on Tuesday. I can't really believe this. I have known him since he was 15. Half of his life. spring 2001, i think we were making gang signs? my hair is totally insane. and i am pale. like a vampire. summer 2005 - i think we were making homemade pretzels? my hair is much better here. we were skinny and tan and childless. 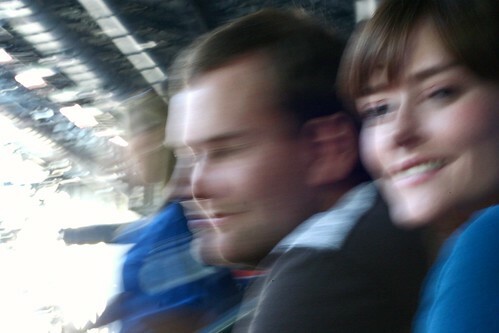 november 2009 - the photo was taken by my 10 year old (9 at the time) brother kai at a colts game. our two kids were with grandma. 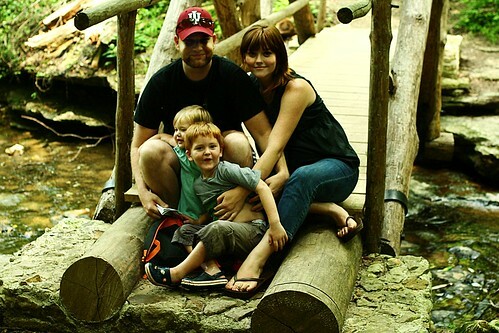 july 2010 - i am 8 months pregnant with our third kid. holy wow. we have many children. We are eating here tomorrow night. Are you reading that package? 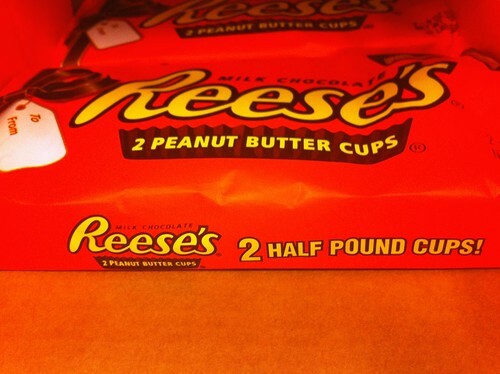 Those are not any ordinary Reese's cups, they are TWO HALF POUND CUPS. A half a pound a piece. Two in a package. 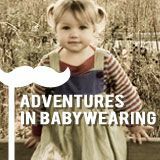 I fear this will not be the week that I finally lose some baby weight. Maybe next week I'll do better! You know, except for Thanksgiving. Nine months up, nine months down, right? I would rather buy toys and make pretzels and throw up gang signs with you than any other person in the world. Sweet!!! Happy birthday to your baby daddy! I long for the days of thin hips & tan legs. you both are so cute! how cool to grow up together like that. and lordhavemercy that is a monster pb cup! and i am covetous. I remember giggling excitedly and wildly in your bed when you first told me that you and Luke were crushing on each other...ahh the forbidden love that turned out to be so right. Half a lifetime--that is great (it is more than half of yours!). Have a lovely evening. Happy birthday to Luke! My husband is a complete Reese's cup junkie. He puts them in the freezer, and once I tried this strange food quirk, I fell in love. We now can't eat Reese's cups unless they're frozen. Who am I kidding...we CAN eat them however they're found, but we prefer frozen. Those old pictures are great! It's so fun to look back and remember. You are more beautiful now than ever, might I add. I mean, you are just stunning regardless, but I think you look lovely in the here and now. Luke's a lucky guy! Perfect in every way. It's a great day to be Luke. And I can't believe he's 30. Now I feel really old. I am glad you found the perfect gift! He is a lucky guy. And I fully back you on te 9 months on 9 months off plan. Holy peanut butter cups. eat lots of food for me and you better not slack on eating half that reeces! yum! you guys are so adorable. Looks like you might conceive a food baby this weekend. Enjoy! i remember when i realized that my husband and i had finally been together for half, and then more than half, of our lives. so awesome. now i'm eagerly awaiting the "we've been married for half of our lifetimes", and then some. Erin, what a cute post on your sweetheart. This birthday sounds like so much fun, and one I'm sure he will remember, because of all the thought put into it. 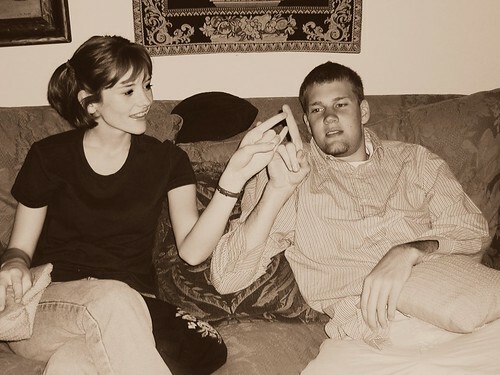 Love, Love all the older photos of you guys too. A very happy birthday to Luke. Happy Birthday to your guy!!! My husband would FREAK out over those huge Reeses! awwwww :) too sweet! enjoy the resse cups it looks so yummy! OH MY WORD! I need to find those cups!! 15 years!! Crazy town. I would say happy birthday bro but he doesn't read your blog. Y'all are gorgeous and now I want and ENORMOUS peanut butter cup. Someone once joked saying that my husband married me young so he could "raise me right" to which he replied..." Oh no...I KNEW I wanted to spend my whole life with her...we just didn't want to waste any time"
HAHA - love the gang signs. That is too adorable to be dorky! I heart that you've been together half his life. Happy birthday to your gang leader, after all, you do have your own little gang now! this is so sweet and lovely. happy birthday, swonderfulman! AND i love you bought yer man an AT-AT. AND I love the gigantico Resees. I'd love to hear all about that steakhouse! How did you like it? I love that you love your husband. You two were and are darling.